Joey King snaps a photo with The Act co-star Calum Worthy while making an appearance together at the Build Series on Thursday afternoon (March 14) in New York City. During the interview, the 19-year-old actress was asked about the emotional toll it took to play Gypsy Blanchard. The Act begins streaming on Hulu on March 20. FYI: Joey is wearing a Vivetta dress, Christian Louboutin shoes, Melinda Maria ear cuffs, EF Collection earrings, and Dana Rebecca rings. Joey King Is Baby Bumpin' as a Pregnant Teen in 'Life in Pieces' - See Every Photo! First Photo of Joey King as Pregnant Teen in 'Life in Pieces' - See It Here! The Act's Joey King & Patricia Arquette Have a Fun Family Night Out! Joey King Pulled the Grossest Prank On Her Older Sister Hunter! 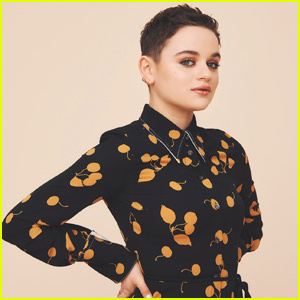 Joey King Wins Favorite Movie Actress at Kids' Choice Awards 2019! The Act's Joey King Enjoys Family Time at Lunch! Joey King Opens Up About Her Humiliating Fall on Sunset Boulevard - Watch! The Act's Joey King - 10 Interesting Things You Might Not Know! 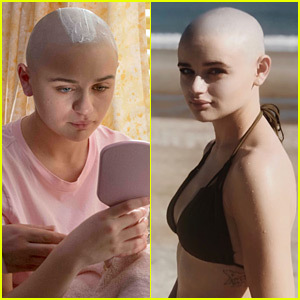 Joey King Really Shaved Her Head for 'The Act' & This Wasn't the First Time! Did Joey King Ever Meet the Real Gypsy Rose Blanchard?